The past couple of weeks, I have been sharing the items that I received in my baby registry gift bags. You can check the Babies R Us registry gift bag here and the Target baby registry gift bag here. 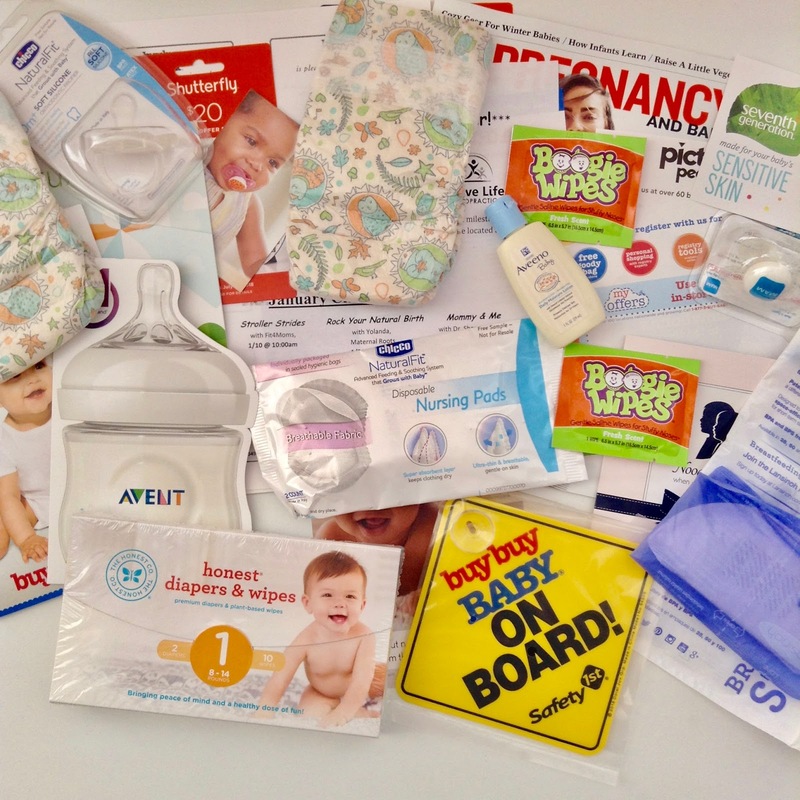 Today I'm excited to share what I received in my Buy Buy Baby registry gift bag. It was my first time going to Buy Buy Baby so I was really excited to see the store. I was really impressed with all of the things that I saw in the store. There were several products that I saw that are not available at Target or Babies R Us. Making a baby registry was really easy and I loved that Buy Buy Baby has registry consultants that are available to help you with any questions. Another really cool thing that I found out is that many Buy Buy Baby locations has a Picture People studio! You can get professional portraits and the photos will be ready on the same day. You can find out more about Buy Buy Baby here. I also received a baby registry book that has information on lots of must haves for a baby and a Fit Pregnancy and Baby magazine. I really love the baby registry book because there was a lot of useful information like a registry checklist, recommendations on the amount of things to get for the baby, tips on picking specific items, additional guides and more advice for mothers who are preparing for their second baby (or third, etc.). Even though Buy Buy Baby is a bit of a drive for me, I definitely plan on shopping there for my baby. Overall, I was very impressed with what I found at Buy Buy Baby as well as the items and coupons that were in the baby registry gift bag. Do you have a Buy Buy Baby in your area? I loved reading this! I am also working on getting my registry gift bags, but I do not have a Buy Buy Baby near me so this one I won't be getting. Congrats by the way! I have been away too long from the blogging world. When are you due? Thank you so much Trish! I'm due in May. When are you due? What a great basket! At first I thought it said Best Buy Baby and I was mind blown. LOL . Lansinoh is a lifesaver for nursing moms. And Aveeno was always my favorite when my boys were babies! Lol when I first heard about Buy Buy Baby, I actually thought it was Best Buy Baby too! Aveeno makes amazing products. I love their cleanser and moisturizer so I'm so excited to try their baby products. That looks like another great haul of stuff! We have one Buy Buy Baby that I know of and it was nowhere close to me so I never went there, but I have heard good things about it! I love how their store is set up. I was amazed that they had a lot of things that Target and Babies R Us does not carry. Congrats to your friend! I'll definitely be on the lookout for a hooded jacket or sweater. Have you tried Etsy? I know OF the store but I don't know if I've been in one. They sound like a wonderful store though, and that's awesome they had some items that other places didn't. What a fun registry bag! It was such a cool store. I can't wait to go back.